Couture Techniques has been the most busiest and demanding module I’ve taken in college so far. The amount of work that goes in creating an evening wear collection is insane. Kudos to the famous designers who come out with such an amazing and eye-pleasing collection season after season. When it comes to couture work, Elie Saab is hands-down my favourite designer. I could go on and on about his intricate detailing and lustrous fabrics he incorporates in his collections. However, we only experienced the slightest glimpse of what it’s like creating an evening wear gown and bustier that is custom-fitted to our size. In this blog post, I share my experience and steps of how I learnt to make these two garments (FYI, this post may get quite wordy, just bare with me). We had ten weeks to create a bustier gown that had to have hand-sewn embellishments and an evening wear gown that incorporated ruching techniques. The designs of these two garments were chosen by us through web-browsing, and later reviewed over with our lecturer. Inspiration Images: Bustier (L) & Evening Wear Gown (R). Our first class was where we drafted our bustier design on paper. We were taught the basic fundaments of couture techniques, like how to shape the bust, where to insert darts or a seam. After having our master plan reviewed by our lecturer, we made paper patterns so that they could be transferred onto fabric to proceed with the toile. A toile is where the garment is made using a cheap fabric so that alterations and experiments can be made before advancing into the final piece. We made our bustier toile using muslin and after it was sewn we had to insert boning to make the bustier more stiff, along with pencil marking the design of our beading. We then wore our bustier toile so the lecturer could make any necessary adjustments regarding the fit of it. While we had the bustier toile complete, we began drafting our evening wear gown. Drafting an evening wear gown was much harder since it had more detailing to consider. For example, my gown had an halter neck design and I was drafting it for the first time. It took a while to figure the construction of this but I got it eventually. After the draft was done, we got it reviewed by our lecturer and then went straight to making pattern pieces. Like the bustier, the evening wear also had to have a toile made first. Upon having it reviewed, my lecturer made a few adjustments to the length of the gown and at the waist. She also marked the pieces that would need to be ruched. Evening Wear Toile: The red lines on the toile indicate the pieces that need to be ruched. So now that both the toile were done, we were proceeding to constructing the garments using their actual fabric. The bustier pattern pieces were placed on the deep royal blue dutchess satin and thicker interfacing and then cut. We traced the embellishment design that was just pencil marked on the toile onto the pattern pieces. Thereafter, using carbon paper the design was transferred onto the actual fabric pieces that was cut. Only after this we began sewing the bustier and only leaving the zipper for the very end. Whereas, for the evening wear only the pieces that required ruching were cut on the burgundy lining fabric first than the actual fabric. After having them interfaced using a thinner interfacing than what was used for the bustier, we used our mannequin and started ruching. Ruching was an extremely time consuming and required a lot of precision, since we were working with the georgette fabric. The ruched lines had to be narrow and thin along the whole piece. I had eight pieces in total to ruche. By the end of this my fingers were so sore and numb that I couldn’t feel anything (there was a lot of pinning to do). After ruching the pieces, each line had to be baste stitched so that the lines would remain in place once the pins were removed (Another moment where I felt I no longer had an index finger or a thumb). Ruching process, where every line is pinned so that it stays in place. 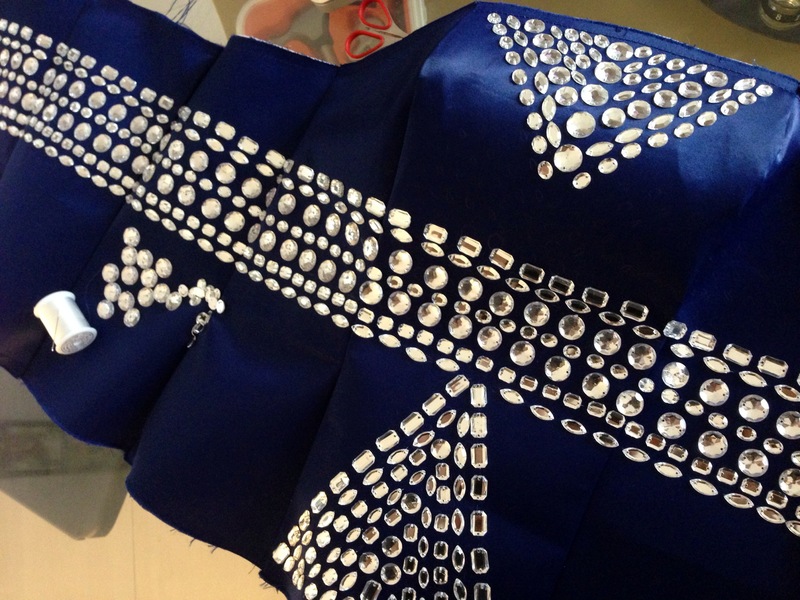 While most of the ruching work took place at school, the beadwork for the bustier was done at home. Hand beading all the bling bling got very tiring (and painful for the fingers, I swear I was just waiting to get a manicure done once all this was over). It took around three weeks for me to complete the beading along with other projects for other classes. Now that most of the handwork (basting and beading) was finished, only the last bit of sewing remained. We attached the invisible zipper and lining to the bustier. Did a few last hand stitches on the lining and that was done. For the evening wear gown, we cut and sewed the skirt pattern piece on the burgundy georgette fabric and attached it with skirt lining. We joined the ruched bodice pieces with the bodice lining and attached it to the skirt. We attached the invisible zipper, and adjusted the hem again with our height just to make sure. Lastly, we hand sewed the hem and finished the gown too! The endless times I’ve complained throughout this module really made it all worth it when my whole class got to wear our creations and see the work we had produced. Those sleepless nights of beading or basting really paid off. In simple words, couture work is not easy. It requires a lot of time and effort to achieve those minimalistic and intricate designs. I feel very fortunate enough to have made two pieces of my choice that I would most definitely wear on a special occasion. Also now that I know the techniques of how to create evening wear dresses I can venture upon creating more garments of my choice (in the future). I hope this photo diary / journal entry has helped you grasp a little about how it’s all done! A class photo of all the girls that went through the struggle of creating couture pieces with me!